We woke up 'late' at 6:40 and packed our gear before heading downstairs for breakfast. When we arrived we where overwhelmed. It was the by far best breakfast of the whole trip. They had everything, an amazing chocolate cake, apple pie, warm croissants, rye bread, cheese, salami, different types of cereal, juices, fresh fruit and so on. Fortunately we were quite hungry and able to try out most of it. After breakfast we shopped for some food for the day since we wanted to take a detour without restaurants today. The hiking trail leaves Stafal on a gravel road providing access to the ski slopes above. 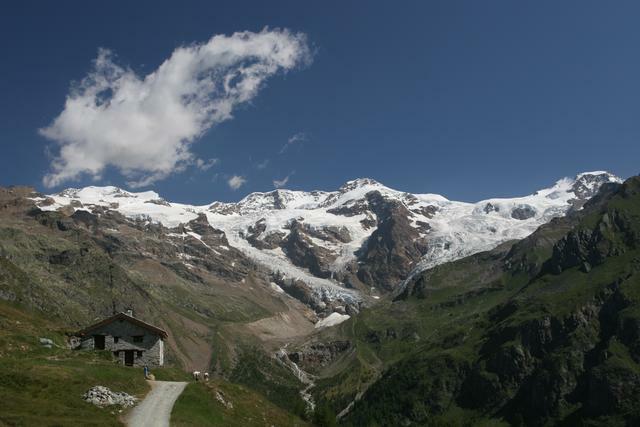 It meanders through beautiful alpine forest and provides repeated views of the Monte Rosa range. We reached Alpe Sitte a little later. In order to avoid the ski slopes which parallel the 'normal' route of the TMR across the Colle di Bettaforca, we decided to take an alternate trail that runs further south. It leads up a bit to the right of the creek in the image to the left and is numbered 8A. 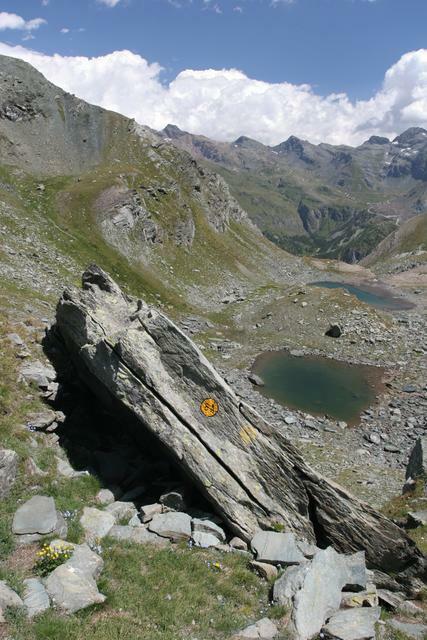 It crosses the mountain range at the Passo del Rothorn (2689 meters). Despite having bought a map in Stafal, we had problems finding the turnoff and ended up crossing this meadow and scrambling up a few marmot-infested slopes before we finally found it. However, the search was definitely worth it. 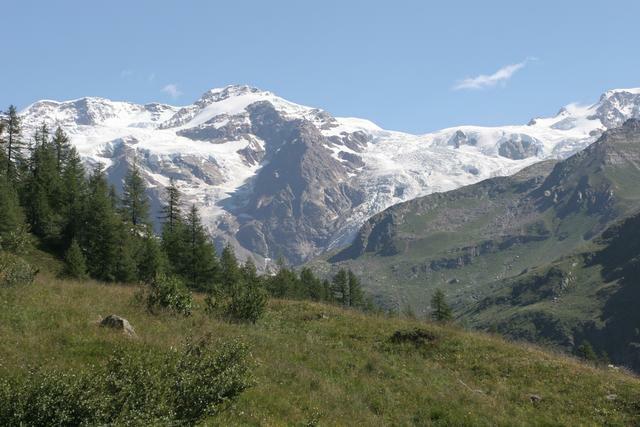 We left the ski slopes and entered a more remote valley with gorgeous views of Monte Rosa. I can highly recommend this alternative. Hiking trail 8A is quite steep at times. The Lysglacier from a different perspective. We could still barely make out the Rifugio Gnifetti on the rocky ridge east of the oval rock outcrop showing through the glacier. Around 12:10 we reached the pass. 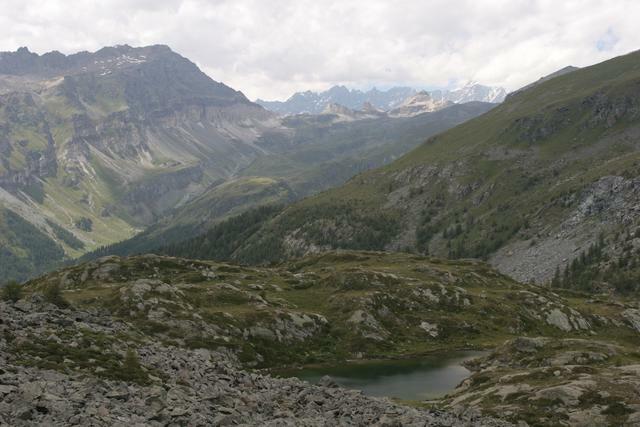 There are two small lakes close to the top of Passo del Rothorn. 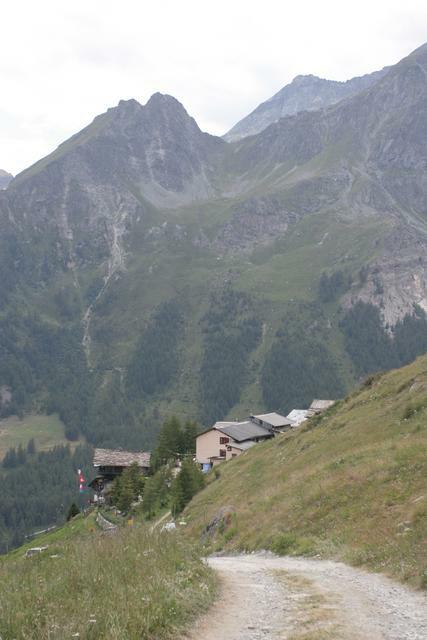 We took our last view back towards Passo Salati and headed down into the next valley. 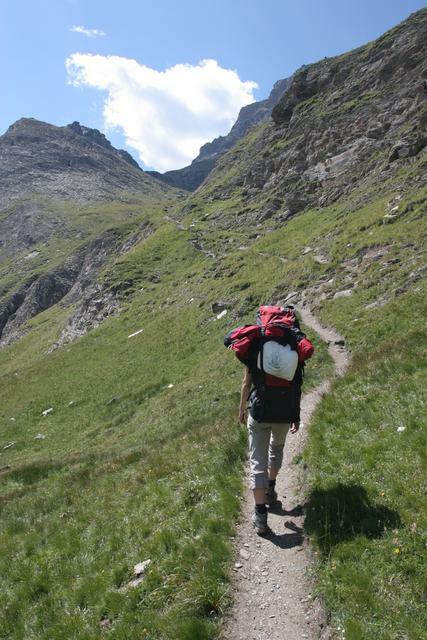 The path down towards Champoluc crosses a huge boulder field. It took quite long to cover a relatively short distance. 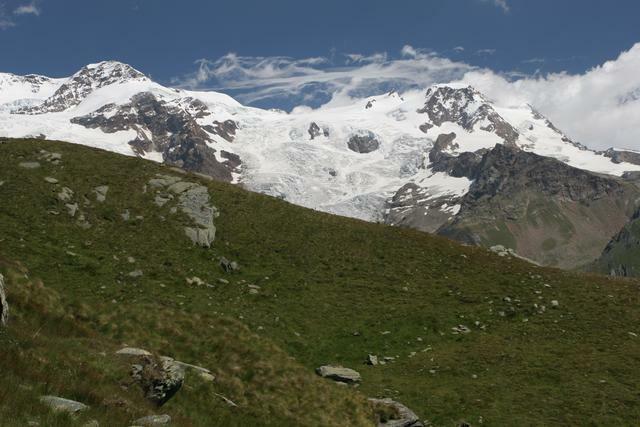 After descending about 450 meters we reached Alpe Contenery and were back in the ugliness of ski slopes. We turned north and headed towards the Vallone della Forca to rejoin the TMR. On the way there we got a good view of the Vallone di Courtod, the valley we would hike up the next day. 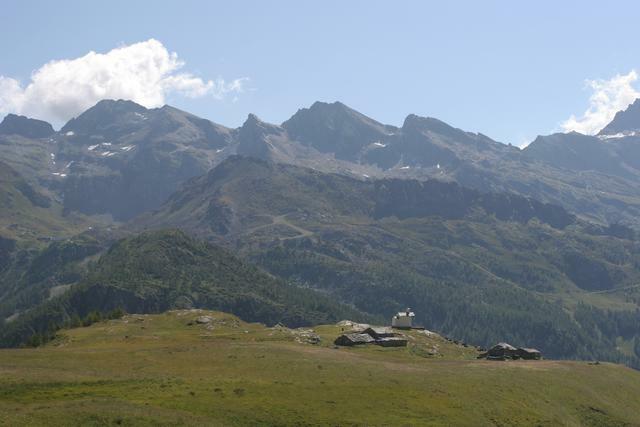 After rejoining the TMR, it was an easy 20 minute downhill to Alpe Resy which has two options for shelter, the Rifugio G.B. 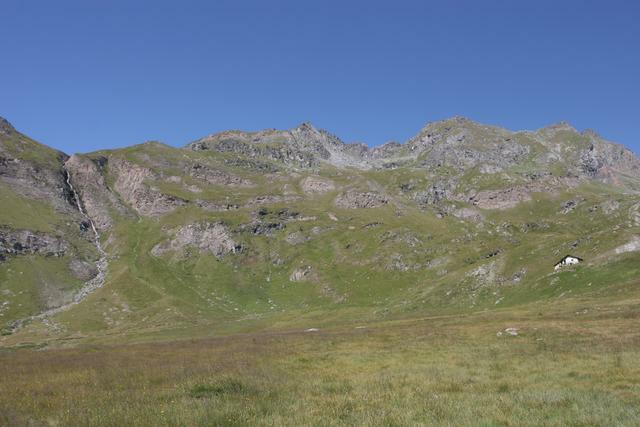 Ferraro and the Rifugio delle Guide Frachey. We stayed in the the former. Apparently competition is good, since the dinner was excellent. They went around with seconds and provided soup AND pasta. They also had delicious home grown salad. Highly recommended. 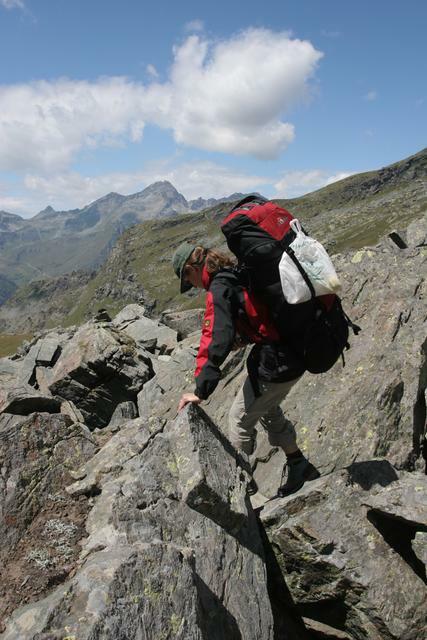 One of the hosts, Fausta, is an avid climber and the walls are full of great pictures from trips to all kinds of high places.She also filled the entire refugio with her cheerfulness and her good humoured kitchen arias.